She held my hand the whole time. Our group walked downstairs from the church building to the dirt road, and veered into even muddier terrain as we went to visit several houses and families in the surrounding neighborhood. The children of the church had scattered around us, in front of us, behind us, talking, shrieking, laughing. She had put her soft hand in mine and we had set out into the hot summer sun. She was probably twelve or thirteen, with a gentle smile and bright eyes. She navigated the yards and streets deftly, past the children's pattering feet, and chickens, and dogs, and piles of trash. She smiled, pulled me along, kept me steady in the midst of the growing crowd. There was so much for me to see with new eyes that she had always seen, that she knew as well as I know my own neighborhood. She held my hand and helped me see it, simply by walking beside me. When we got back to the church, she told me her name. And she told me that math was her favorite subject to study in school. My time with her is one of my most vivid memories from that trip to Nigeria almost three years ago... Her loveliness, her calm, her smile, her eagerness, yes, even her love of math, which always impresses this numbers-challenged English major. Her whole demeanor shone with something deep and true. I find myself thinking of her a lot these days, wondering what she is doing now, whether she still loves math, what she might do with her life. 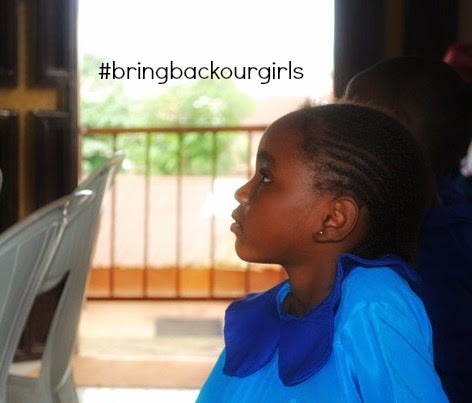 I wonder because of the three hundred girls in the north of her country who are missing, who were kidnapped in the middle of the night from their dormitories and may now be married off to extremists, may be sold into situations horrific and unimaginable. I think of them and I see her face, kind and smiling, steering me through the small unknown of that day. Now girls like her are in an unknown far more perilous, and the world is crying out. Crying out for their return, for their worth, for their potential and their dreams. In some ways I cannot comprehend it; how can such a large number simply disappear? In other ways I feel it very tangibly; I can imagine their enthusiasm, their hard work, their kind smiles, and the void without them in their families, community, country, and world. I pray that the world will recognize the unacceptable nature of this crime and too many others like it, impacting too many children all over the world. I pray for positive action against such crimes. I pray that we will learn compassion. I pray for my friend, and for the many others I met while I was there. I pray that they are thriving. I pray for these girls, for their safety and rescue. I pray for their resilience, for their capacity for joy and love, for their dedication and their hopes. The world loses something deep and hopeful without them, without all children missing or enslaved. Bring back our precious children. Bring back our precious girls. My friend Andrew's nonprofit foundation, Access to Success, works hard to make sure that children in Nigeria are empowered through the circle of education, faith and athletics. Check out the foundation's website to learn more about what you can do to help. Claire, thanks for your words. I read this and found it helpful too.